Whether you’re celebrating your first anniversary or marking a big milestone like 20 years of marriage, it’s important to put effort into how you commemorate the event. 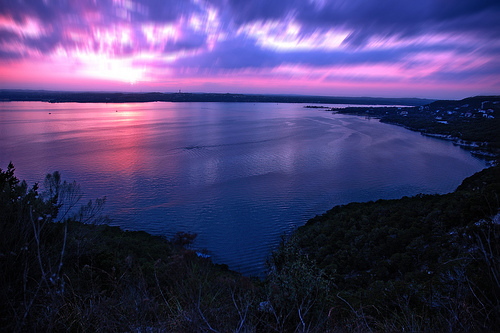 If you’re looking for inspiration in a beautiful, romantic setting in the Austin area, look no further than Lake Travis at sunset. Should You Plan a Surprise Anniversary Date? Well, that depends. While it may be romantic to blindfold your significant other, pack them into a limo, and whisk them off to their destination, if you happen to be married to the type that hates surprises, this plan may not go over too well. On the other hand, if you’re married to a hopeless romantic, he or she may truly appreciate the time and effort that you have put into renting a limo, booking a reservation, and setting aside a special evening that the two of you can enjoy together. If you must, compromise may be necessary in this type of delicate situation. If you happen to be married to someone who hates surprises, consider telling them where your anniversary meal will be held – at Lake Travis – but save some of the special details for the night of the event. For example, you can still surprise your spouse with a luxurious limousine rental, champagne on the way to dinner, and a special anniversary token, like a new necklace or bracelet. If you have the whole day available, why not go all out? Although Lake Travis is most romantic at night as the sun goes down, you can start your anniversary out right with an afternoon at the Lakeway Resort and Spa. There you can enjoy luxury treatments like a deep tissue or Swedish massage, a reflexology treatment, a body wrap, and much more. You can also pull out all the stops and pamper your significant other with a professional haircut and style, as well as a makeup application, before your date begins. From there, it’s time to cap off the evening with a beautiful, romantic dinner overlooking the lake. Locals recommend The Oasis without a doubt, also known as the Sunset Capital of Texas. Or you may enjoy finer dining in Soleil, which offers new American cuisine with rustic entrées like pan roasted duck breast, glazed pork tenderloin, and seared sea bass. No matter where you choose to spend your anniversary, the point is that you are marking another important year with the one you love. Take this time to relax, reflect, and remember what brought you together in the first place!